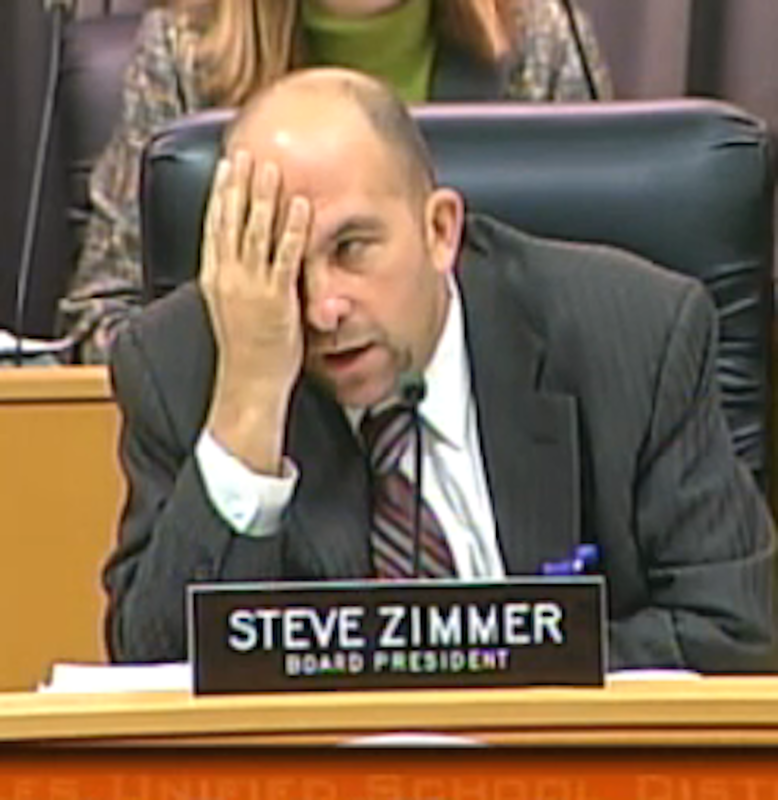 Steve Zimmer about nine hours into the meeting. The LA Unified School Board convened at 10 a.m. and didn’t adjourn until more than 12 hours later yesterday, in a series of meetings that ran the gamut from moving forward on finding a new superintendent, to confronting ugly budget realities to diving into the minutiae of charter school applications. For background information, each member had 1,209 pages of supplemental paperwork at the ready. Yes, it was long and tedious, and bleary-eyed members were begging for adjournment. They had it better than some members of the public, eager to share their views with the board. Outside district headquarters, Maria Hernandez stepped in line with her 3-year-old at 5:30 a.m., ready to talk about how great her Celerity Rolas Charter School has helped her 7th grade son. She was flanked by Myra Guttierez who has a son and daughter in the school, and Kenja Jackson, who attended the school and is now in college. They finally got to speak at about 9 p.m. when school board president Steve Zimmer took pity on the families with small children who waited for so long to speak. But their school was denied a charter petition, as was Celerity Himalia Charter School, because the LAUSD staff recommended against it. And Mónica Ratliff initiated a measure that would ask for charter school transparency, which is almost identical one that was proposed and defeated last year by ousted school board member Bennett Kayser. It asks for charter schools to comply with state guidelines for open meetings and inform parents about school-related items like traditional school do. Those two plans will be up for discussion and vote at the next meeting, on Dec. 8. The board approved five-year renewals of 14 other charter schools, interspersed with hearing from parents, teachers, students and administrators talking about the benefits of the schools. When the board voted (mostly unanimously) for approval, the audience erupted in applause. Yet, the school board voted to turn down a plan for El Camino Real K-8 Charter School to bring 525 students there and redevelop the run-down site. Why? The district wants to develop a school for students who are autistic and highly gifted. Superintendent Ramon Cortines said that he told the El Camino Real petitioner, David Fehte, about the plans for the LAUSD-owned property at a recent meeting. Fehte seemed angry when the petition was voted down, but had another proposal for the abandoned Highlander Campus, which was closed in 1982 and vacant since 2004. Neighbors such as Jackie Keen said they looked forward to the abandoned building becoming a school again. But, Schmerelson said he met with the local district superintendent who had plans for the campus. Fehte said that was news to him. When there are waiting lists at high performing schools that are bursting at the seams it does not make sense to use taxpayer’s money to start a new charter school at LAUSD-owned sites, Schmerelson said. “I do not want to waste the petitioner’s time,” he added. Ratliff asked to delay the petition proposal for the site until next month. Fehte reluctantly agreed. Charter school advocates not only spoke up in favor of school petitions, but against some of the bond money being spent that should be shared with charter schools. An attorney representing the California Charter Schools Association, Winston Stromberg, suggested that one of the bond measures to improve sites for students with disabilities was rushed through without stakeholder input. He recommended that the school board postpone action on the reallocation of the bonds. Sarah Angel of CCSA asked the board for a meeting before the vote. “We would ask that you table this at this time and move it to the budget committee to figure out priorities,” she said. 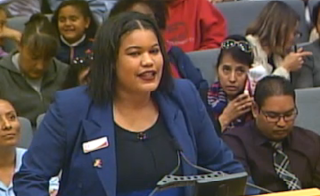 “In the spirit of collaboration, the board of education should have a hearing. Charters have applied for this money and have not had traction.” In fact, she said the district facilities administrators told them to come back later with their requests. Ref Rodriguez recused himself from the discussion of renewal for Partnership to Uplift Communities charter schools, which he co-founded. There was some discussion in denying one petition because of an attorney general’s investigation into a mismanagement issue and conflict of interest. Kenja Jackson speaks for a charter school that got denied. The board voted unanimously to approve the two renewal requests. Zimmer seemed frustrated at the length of the meeting, and his accommodations to allow everyone in the audience to speak. When board executive officer Jefferson Crain asked to extend the meeting yet again, the board sounded a collective groan. “I have to go home and feed by dog,” said board member Richard Vladovic.